Marshall, Gerstein & Borun LLP is pleased to announce that partner Julianne Hartzell was selected as one of the Law Bulletin Publishing Company’s “40 Illinois Attorneys Under Forty to Watch.” Ms. Hartzell was selected from more than 1,100 nominees, based on the Law Bulletin’s annual survey of attorneys to identify this year’s most talented young lawyers in Illinois. Ms. Hartzell was praised by her peers as a “respected, highly skilled, and formidable IP litigator” with a commitment to pro bono work and to advancing the professional development of women in law. “Given her diligent and devoted work for her clients, her firm, and the legal community, Julianne exemplifies what the [40 Under 40] committee seeks to honor: selfless, top-notch ‘up and comers’ who are destined for continued success,” said a nominator who has worked closely with Ms. Hartzell as part of her efforts for the Coalition of Women’s Initiatives in Law. An attorney who served as co-counsel with Ms. Hartzell on a pro bono case described her as “a very strategic litigator” and an “outstanding trial lawyer, with excellent courtroom instincts.” “[Julianne] is tough, but also very personable and knows how to bring out the best in witnesses for trial…” she said. Ms. Hartzell enforces and defends lawsuits involving patents, trademarks, copyrights, and trade secrets. She has represented clients in such wide-ranging fields as consumer products, medical devices, manufacturing, pharmaceuticals, and internet technology. A committed advocate, Ms. Hartzell works closely with her clients to understand their business needs, seeking the most efficient route to resolve litigation in a way that satisfies those needs. 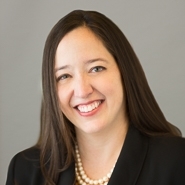 An invaluable member of the Firm’s litigation practice, Ms. Hartzell has also found time to increase the Firm’s pro bono participation, serve as a founding partner of the Firm’s Diversity Committee, identify and recruit new talent as chair of the Firm’s Recruiting Committee, and actively mentor associates. Ms. Hartzell has also devoted significant time to serving the legal community as a past board member of the Richard Linn American Inn of Court, a board member, past president, and committee chair of the Coalition of Women’s Initiatives in Law, and a committee member of the Intellectual Property Owner’s Association and the International Trademark Association. Ms. Hartzell was the recipient of the Chicago Bar Association Alliance for Women’s 2012 Alta May Hulett Award. Named for the first woman in Illinois to become an attorney, the award recognizes outstanding women lawyers who have significantly contributed to the advancement of women in the legal profession or other areas, and whose careers exemplify the highest level of professional achievement, ethics, and excellence. She has also been selected for inclusion in the 2011-2014 Illinois Rising Stars® lists, featuring outstanding young attorneys in the state and invited to be a Fellow of the Litigation Counsel of America. She also holds a Martindale-Hubbell® AV Preeminent Peer Review Rating and was selected as a 2013 "Top Rated Lawyer in Intellectual Property" by American Lawyer Media (ALM) and Martindale-Hubbell. Ms. Hartzell received a J.D. from the University of Michigan Law School and a Bachelor of Science degree in mechanical and biomedical engineering from Duke University. The “40 Illinois Attorneys Under Forty to Watch” list is featured in the October 2014 edition of Chicago Lawyer magazine and included with an issue of the Chicago Daily Law Bulletin. To visit Ms. Hartzell’s profile, click here. Marshall, Gerstein & Borun LLP is exclusively focused on intellectual property law. Nearly half of the Firm’s professionals have been in-house as general counsel, patent counsel, technology transfer managers, scientists, engineers, or consultants. The firm’s professionals offer depth of talent and seasoned experience in devising and executing intellectual property strategy and comprehensive IP solutions. Chambers & Partners has ranked Marshall, Gerstein & Borun as “first-rate for litigation,” and “one of the best biotechnology practices in the entire country.” Corporate Counsel magazine lists the Firm as a “Go-To Law Firm of the Top 500 Companies” for intellectual property and litigation. The Firm is also ranked as a top intellectual property law firm by Managing IP, Fortune, Intellectual Property Today, and Intellectual Asset Management magazines.